If you follow my blog regularly, you may remember I mentioned having to drag myself through Dragon Springs Road by Janie Chang. So, it might come as a surprise that I gave the book 4 stars at Goodreads and recommend it highly. Jialing lives in the Western Residence of a three-residence compound. Her mother occasionally leaves for a night or two and Jialing is accustomed to spending time alone, staying quiet when necessary. So, she stays hidden when her mother packs up for a short trip, just as the owners of the compound move away. But, then her mother doesn't return. Abandoned but certain her mother will eventually return, Jialing is taken on by the new owners of her home, the Yangs, as a bond slave. She will eventually be able to buy her freedom. But, what will happen then? As the years pass, there is political upheaval and the ups and downs of business ownership amongst the families that live in the main residence. Jialing becomes friends with Anjuin, the daughter of the Yang family, and eventually is able to receive an education. But, the odds are stacked against her. She is part Asian and it's clear that she's also part caucasian. Because of her mixed heritage, it's unlikely she'll ever be employed. Will Jialing somehow manage to beat the odds? Will the magical fox spirit that watches over Jialing help her find her way, or will she (the fox spirit) pass through a door to the next world and leave Jialing to fend for herself? Is Jialing's mother alive? If so, where did she go? Highly recommended - I'm assuming the fact that I read Dragon Springs Road so slowly is just a timing issue because the story is indisputably a good one, with plenty of highs and lows and never a hint as to how it will end. I think that's why I continued to read, even though the reading went slowly. It may have been slow going but I was well aware that the storyline was a good one, suitably complex and with characters worth following. I loved the ending and when I closed the book, I felt satisfied. I particularly enjoyed the fox element, which lent the story a magical touch. 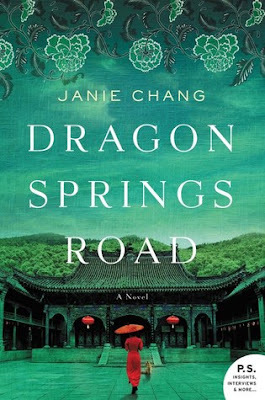 Dragon Springs Road takes place in China in the early 20th Century. I read two of the March graphic memoir series in January, took a break, and finished up the third in February, which feels like pretty nice timing because of Black History Month. I wasn't thinking about Black History Month when I bought them, though; the purchase was really a reaction to our current president's bizarre tweets about Lewis, a man of action who did not deserve the lack of respect shown to him. I knew about the March series, but had put off buying them until then. I'm not going to go into the details of what each of the books covers individually because the truth is, I don't entirely remember and I don't think that the details are all that important. What's most important to know is that the three books, basically a biography and history set in graphic form, describe John Lewis's early years, why he was inspired to get involved in the dangerous fight for civil rights, the progress of the Civil Rights Movement over many years, how participants were trained in peaceful protest, and the final results. When I read March, Book One, I'm not sure exactly what I was expecting but it begins with John Lewis as a child, the hardships he endured, his sheer determination to acquire an education, and his fiercely independent temperament. Even as a boy, he was courageous. A parallel story is shown, the story of John Lewis attending Barack Obama's inauguration. The final book ends with the signing of the Voting Rights Act on August 6, 1965 and a final scene in which, after President Obama's inauguration, Lewis says he's been thinking about that comic book idea . . . the book you hold in your hands, of course. Wonderful ending. Highly recommended - I was surprised at how many times I got a little teary and had to set aside the books to take a break. The amount of violence peaceful protestors had to endure for years honestly shocked me -- and I lived through that time! Granted, I was quite young and there was no such thing as Black History Month when I was in school, but I've seen plenty of film clips, over the years. I don't think I'd ever mentally stitched them together and that's what this series is good for. Especially when read back-to-back, you get a genuine sense for the endurance and determination that was required as activists made baby steps toward their right to vote. The only problems I had at all with the books were that sometimes I couldn't follow what was going on in a particular frame or set of frames (a problem I always have with graphic novels) and some of the details about the various organizations that worked together or in opposition to each other (but for the same goal) got mixed up in my head. There were quite a few of them and the meetings they held could be kind of dull, yet they served a purpose as things were not static; they had to constantly adjust to the reactions of those around them. In general, I was impressed and I'm hoping to insert a bit more black history into my reading life because I clearly am lacking in that area. Important addendum: A lot of people were talking about the March books when I bought the set (I got the slipcased set of all three) and a couple people I know mentioned having read the first book but not the rest, so I was a little surprised to find that the ending of the first March book is a bit of a cliffhanger. They are definitely not meant to stand alone. The series together tells a complete story and I recommend reading them close together, if you can. I very seldom read books about how to be happy because I think they tend to either have only a short-term effect or I find them impractical in some way. I was interested in reading The Little Book of Hygge by Meik Wiking, though, because of the fact that the book is so stinking cute (maybe not the best reason) and it's about how people choose to add joy to their lives in a particular place. Maybe it would not be as applicable as I'd like, but I was still curious. I was not disappointed. The Little Book of Hygge begins with a brief explanation of the concept of hygge - how to pronounce the word (HOO-GA), the cozy feeling it implies, and why something like a storm merely adds to the kind of comfort and joy that one can experience from elements of hygge like a warm sweater, soft socks, a book, the presence of a few friends, and mellow lighting. Then, it goes into greater detail. Light is apparently a very big deal in Denmark and my first thought was probably the same as that of most Americans: Ack - candles - fire hazard! Danish people love candles (unscented) and tend to set the mood by lighting a lot of them. While I would love to do that, myself, I am definitely paranoid about fire hazards and it's true that the seeking of warmth generally does not apply to us because of our warm climate. One situation that was described repeatedly was friends gathering around a fire or out on a deck with a hot drink after skiing, when everyone is too tired to speak and the presence of others is a joy, in and of itself. I do love a crackling fire. But, I doubt I'll ever experience skiing with friends. Oddly, as unrelatable as that is to an American gal living in the Deep South, it's easy enough to imagine and gives you a good sense of the kind of atmosphere hygge is about. As to the idea of lighting lots of candles . . . it sounds lovely in abstract but fire is my pet irrational fear. I am absolutely terrified of fire. My husband loves to light scented candles; I enjoy blowing them out. I imagine my cats jumping onto countertops and setting their tails on fire. So, the lighting concept makes sense to me and yet it feels like something I will never accomplish. There are plenty more subjects: togetherness, food and drink, clothing, hygge inside and outside the home, Christmas. There is even a summer hygge chapter. Like a Danish winter, Danish summer could not be farther from our personal experience. Again, I don't think that matters because I still got the sense of what the Danish do to make comfort and happiness a part of their lives. The author talks about other aspects that contribute to happiness, apart from the hygge that is deliberately created through atmosphere. For example, the fact that the Danish are taxed heavily but their tax money goes toward a marvelous social safety net. Healthcare is free; a university education is free. Because the cost of health and education are not concerns, the Danish have less stressful lives to begin with, which gives them the ability to focus on creating joy. But, we can all learn from them, of course. My favorite part of the book is probably the Hygge Wishlist with 10 items "that will make your home more hygellig," including a comfortable corner (a hyggekrog), things made out of wood or ceramics, books, nature, vintage lighting, and tactile things like a warm drink or a soft pillow. You don't have to live in a cold climate to enjoy any of those things - well, apart from holding a cup of hot liquid. We do save the warm drinks for winter. 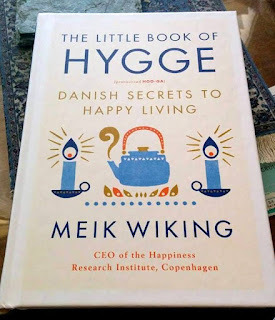 Recommended - While I was reading The Little Book of Hygge, I frequently read bits and pieces to my husband and told him a bout how the Danish decorate and use light, comfortable clothing, warm drinks, and friendship to create happiness. Our decorating style - when we put out any effort at all - could be described as Danish Modern, so there are aspects of the decorating already present in our home. We both came out of the reading feeling like it's something we want to study further and that we should focus on ridding ourselves of some of the home furnishings that we ended up with by default (chiefly through the deaths of family members). I put myself on a book-buying ban around the time that I was reading The Little Book of Hygge but I'm still planning to buy some books about the Danish decorating style to use as encouragement and I plan to return to The Little Book of Hygge for advice. As far removed as we are from some of the aspects of Danish life that lead to coziness, like the cold, the snow, and the long, dark winters, I think there's something for everyone in The Little Book of Hygge. It's Monday and I'm finally doing a Malarkey post on time! I'll try to keep that up. 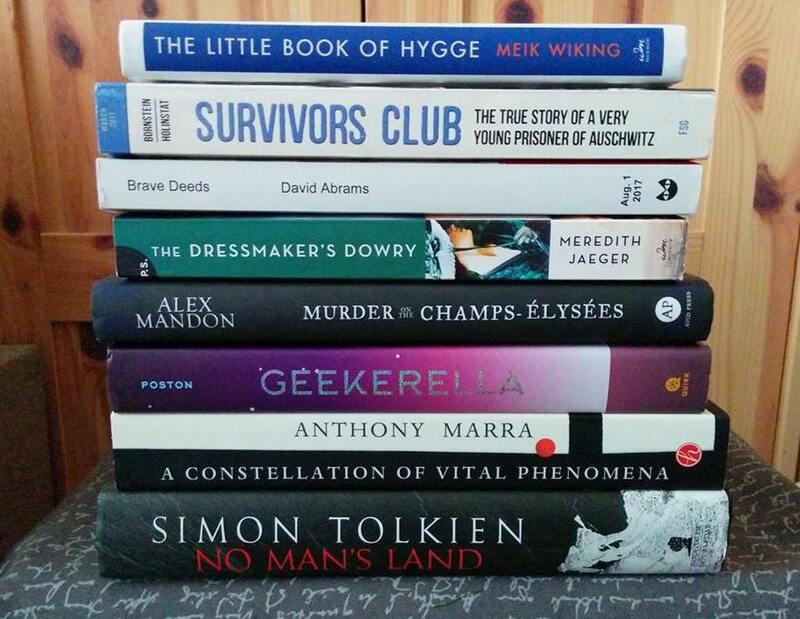 Last week was not a bad reading week, not a great one. Not a terrible posting week, not a good one. I'm not going to hazard any predictions about this week. That would be crazy. One was a book that I found intriguing but slow, the other I could not put down. Hmm, this seems to lean closer to "bad blogging week" but, again, lately I'm just happy to get any reviews written at all. Metaphors Be With You by Mardy Grothe - I've returned to this one after having set it aside for several weeks. Since I finished Survivors Club late last night, I haven't yet determined what else I'll read next, although I'm hoping to get started on Hidden Figures and I have several novels piled next to the bed. I'll choose my next fiction read, tonight. I can answer some of the questions I posed, last week, now. Will I get around to reading a classic, this month? Oh, oops, actually . . . I did read one: The Handmaid's Tale. It's a modern classic but a classic, nevertheless. I was hoping to read a second one because I didn't manage to finish a classic in January, but I'll take what I can get. Will I locate the book I chose as my feminist read of the month? I found it! But, I haven't read a single page so it will be shoved into March. We'll see if I end up reading just the one or attempt two feminist reads to make up for February. I don't know what became of the discussion about The Handmaid's Tale. I thought it was going to occur at a particular Facebook site and it didn't, so clearly I missed it. I have no idea where discussion was held. Still, I'm glad I read the book. I've meant to read it for ages and I'm always happy when I manage to read another book that's been on my shelves for years. I'm in a Facebook kitty group with lots of New Zealanders, who have an interesting way of describing their cats that always makes me smile. 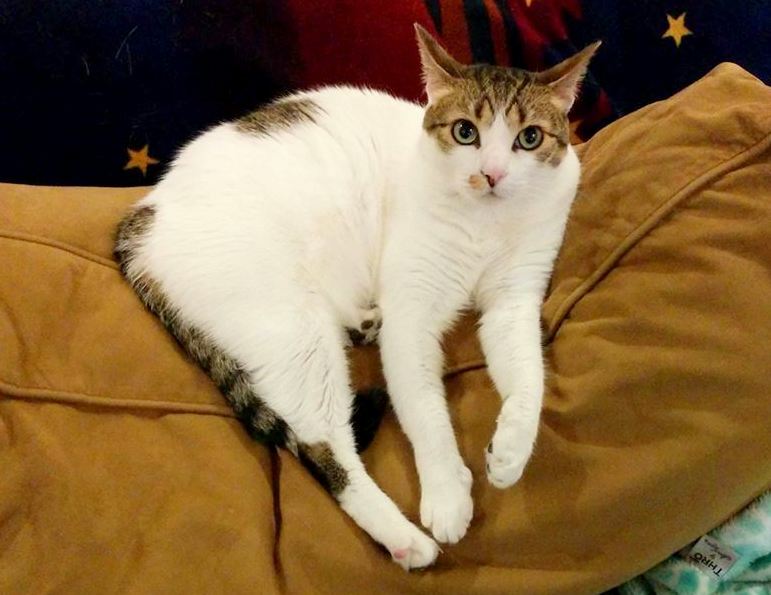 This pose would be described thusly: "Kitter is heckin' comfy," and something about the "beans" (which I call "paw pads" - kind of boring, by comparison). I love the way they talk. 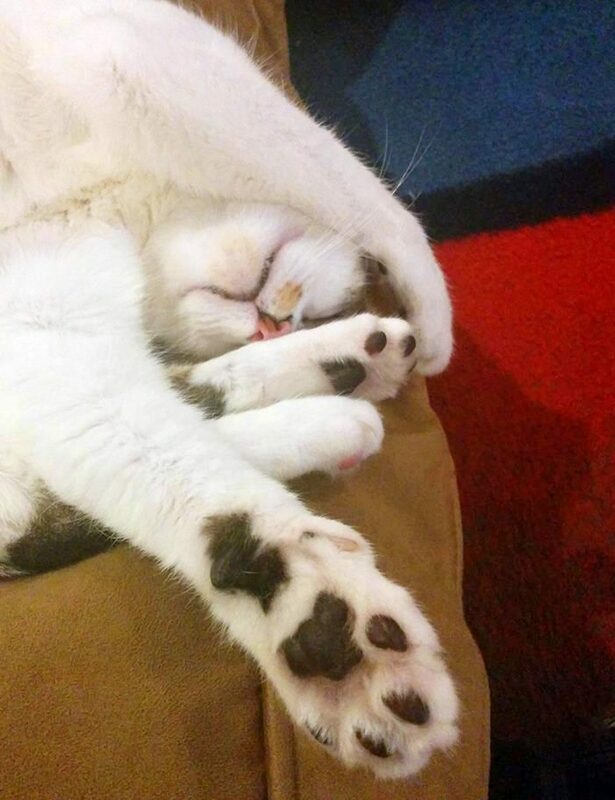 Isabel was definitely heckin' comfy and showing off the beans. 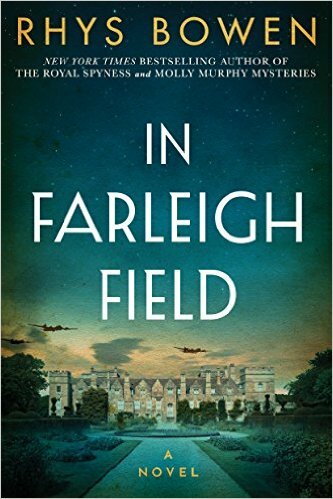 There are WWII-era planes flying over the British estate on the cover of In Farleigh Field, so it should come as no surprise that I wanted to read the book. I am hard-pressed to ever say no to a WWII book of any kind. 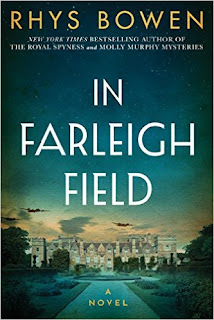 In Farleigh Field is a story that takes place partly in Kent, home to the Sutton family's large estate, Farleigh; Bletchley Park, where one of the Sutton daughters translates German messages; and London, where the son of the local vicar and friend to the Sutton daughters, Ben Cresswell, works for MI5. There's a prologue that takes place in 1939 at a cricket match on the grounds of the village. While prologues are something I can take or leave, I think the author did a nice job of introducing the characters in the prologue: Jeremy, the daredevil aristocrat, his more mild-mannered friend Ben, and the woman they both adore, Pamela "Pamma" Sutton. After Jeremy lands his plane on the cricket field and spirits Ben away, the real story begins. In 1941, Jeremy is an RAF pilot who has been captured by the enemy. Ben has a metal knee that he acquired in a plane crash, and Pamma is working a night shift at Bletchley Park. There's a child named Alfie, an evacuee from London, who discovers the body of a man whose parachute didn't open on the grounds of Farleigh. The Sutton family now lives in a single wing of their estate while soldiers have taken over the rest and are billeted in their home. The dead parachutist wears the uniform of one of the soldiers on the estate but the billeted soldiers don't jump from planes and there's something off about his uniform. The only clue as to why he may have arrived at Farleigh is a single photograph. Without interacting, a number of different people and agencies are set to work solving the mystery of the soldier who died in Farleigh Field. Will they figure out the mystery in time to stop a nefarious plot? There is a large cast and a number of other minor storylines, but the heart of the book is the story of the deceased parachutist and what he may have been up to with young love as a secondary storyline. Recommended - Unfortunately, there were some plot holes and I don't think the ending quite worked, apart from the romantic storyline. But, I liked the main characters (a few of the more minor characters were a little too stereotypical) and enjoyed the interaction between them, so I didn't mind the book's flaws. As is often the case with mysteries -- and I would not call this a mystery novel but a novel with a touch of mystery -- I didn't always understand how those investigating came to their conclusions or even why they felt obligated to pursue a particular line of reasoning. But, since I thought of the dead body as only one strand of the story, which was a mix of mystery and romance as well as a family story set during a short stretch of WWII, I just went with the flow and enjoyed it. If you're a WWII fan, you may find the book flawed, as I did, but I still found it an enjoyable read and well worth my time. It's just after 9:00 PM and I've suddenly remembered that I'm a blogger. Ha. I guess after 10 1/2 years you get a little lax, sometimes. There was only one arrival, this week, and it showed up this afternoon. Sounds a bit on the tragic side, which is interesting because I don't usually request books that are described as tragedy. I do prefer sweetness and light. And, yet, I'm definitely still intrigued. I think the word "mermaid" may be one of those things that grabs my attention, much like a cover illustration with a beautiful red dress. You might be interested to find out that after all the hair-pulling just getting through Dragon Springs Road, I thought it was an excellent read. I think it's just that I'm a little bit slumpy. In Farleigh Field took me almost as long to get through. Again, I liked it. I thought there were some plot holes but it was well written; I'm just reading slower than usual. There are other books with bookmarks in them but since I haven't recently read a single page from any of them I'm not going to bother listing them, here. I just started The Good Daughter, this morning. I haven't gotten very far into it so I can't say whether or not it will stick. Fingers crossed. I'm almost embarrassed about my wordy review of The Wars of the Roosevelts because chances are good that people who are the most interested in it already know a great deal of what I babbled about learning, but that kind of rambling is definitely indicative of enjoyment. My Fiona Friday post of Isabel is a phone photo and therefore not high quality but it's become a new favorite. 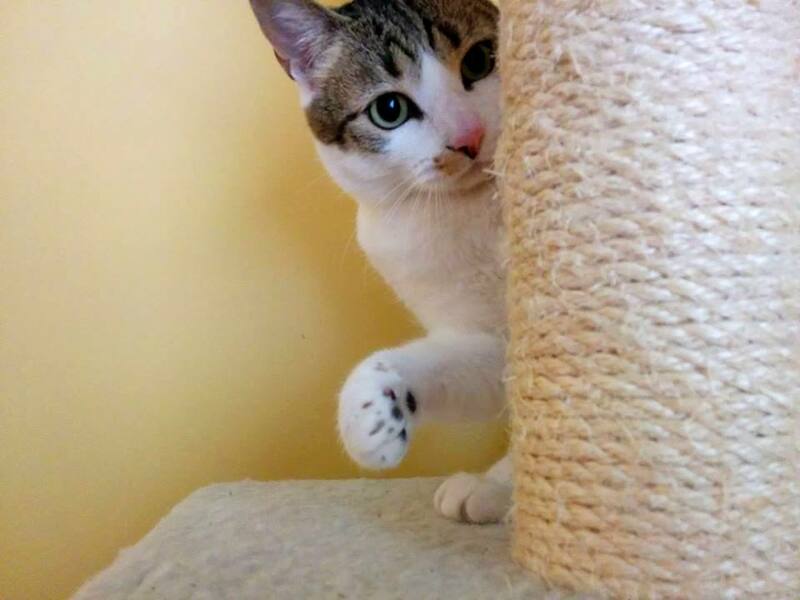 I love the way she has that little paw curled, ready to reach out. Even when she's being feisty, I can actually hold out a hand, even touch her paw without getting clawed - something that's true of both of my kitties. I love that about them. They are pretty much terrified of everyone outside the family but such amazingly gentle animals. There's a lot of finger crossing going on, around here. Will I get around to reading a classic, this month? Fingers crossed. Will I locate the book I chose as my feminist read of the month? Fingers crossed. Will I manage to read it before the month ends? Oof. Probably not. But, boy, have I learned how to pep talk myself through all these things. I remember when I would have been absolutely stressed out of my mind over the facts that I've not only read a mere 5 books with a week left to the month but also have utterly failed at my other goals. Not anymore. I may cross my fingers a lot and try to stay up longer so I can read a few more pages but I just can't be bothered to lose my mind. I'm too old for that. I guess that's one of the really great things about aging. Someone has been in a very playful mood, today! After yesterday's rambling post, you deserve a nice, short one. 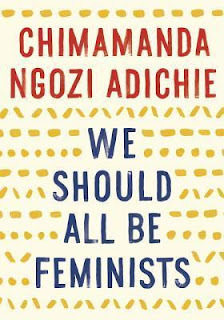 And, that should be easy enough as We Should All Be Feminists is a very quick read - the first for my personal Feminist Reading Challenge in 2017. I found We Should All Be Feminists incisive and revealing, particularly for her unique view as an African woman who has spent a lot of time in America. I especially enjoyed reading about the differences between life as a woman in Africa and in the United States. Having said that, a lot of what she had to say was familiar. Where I may have read similar thoughts, I can't say. I've only read a few books about feminism or by feminist authors. I didn't mind the repetition at all because her perspective is a unique one and who knows? It may be the only book about feminism some people read. If so, it's a good choice because of its brevity and clarity. Highly recommended - Especially recommended if you're looking for a very quick read about feminism and why treatment of women as equals is healthier for all concerned. Surprise! Because the book was short and I was in a hurry (January was well under way when I decided to challenge myself to read feminist works, whether fiction or nonfiction), I opted to buy and read the book in electronic form! I know, shocking. Well, it's shocking to those who know about my aversion to e-books. I asked for suggestions of feminist titles at Facebook and when I went back to collect the titles, I couldn't find the post. I'm going to look again because sometimes things disappear from Facebook and then reappear, presumably due to those annoying algorithms. I know I didn't delete it. But, I figure it doesn't hurt to ask for more suggestions, so please let me know if there are any feminist titles you highly recommend. I broke my book-buying ban to order a couple that were recommended on Twitter. I figure that's legit, buying books for my personal reading challenge, right? Right. I've always been fascinated by the Roosevelt family, so it was a no-brainer that I'd want to read The Wars of the Roosevelts: The Ruthless Rise of America's Greatest Political Family by William J. Mann when it was offered to me for review. The Wars of the Roosevelts is about the infighting within the Roosevelt family that went on for decades, including both political backbiting as well as the horrible things they did to each other personally in the name of rising to political power. Warning: This is a long review because I shared a few things I found fascinating. It's not as general as my normal review. Feel free to skip down to my recommendation, near the bottom of the post. The Wars of the Roosevelts begins with Theodore Roosevelt's concerns about his brother, Eleanor Roosevelt's father Elliott. Elliott and his wife were the partying type and Theodore was concerned that Elliott and his wife Anna's exploits would interfere with his political aspirations. After Elliott was rude to guests at a party thrown by Theodore's "chief booster and unofficial adviser," Bye, Theodore said, "I am distressed beyond measure." [...] Theodore was keenly aware of decorum and discretion, as any man with his eye on the presidency would be. He knew careers could be derailed in the drawing rooms of New York society, where Elliott and Anna had made themselves infamous. People would be very reluctant about backing a candidate with a black sheep such as Elliott in his family. It's notable that every generation and every branch of the family managed to cough up at least one black sheep. The author goes on to describe the years of Theodore's attacks on Elliott -- how he constantly tried to separate Anna and Elliott and repeatedly attempted to have Elliott locked away in sanitariums for "moral insanity". The author talks about the impact Theodore's cruel ambition had on Eleanor, who was an outcast even when staying with Theodore's family, the Oyster Bay Roosevelts, and how his determination to physically challenge his own children affected their lives. In addition to direct family ties, the author also follows the progress of Elliott's illegitimate child, also named Elliott, who was never acknowledged by the family but who was every bit as intelligent and ambitious as the relatives he never got to know. There's a very satisfying conclusion to his story, late in the book. I have a dozen flags marking passages in The Wars of the Roosevelts. I found it utterly fascinating, not only for the in-depth view of the Roosevelts but also for the political insights. For one thing, I was completely unaware that Progressives were originally a faction of the Republican party. Since Theodore was a Republican Progressive and Franklin a Democrat who became politically active after the Progressives vaulted to the opposite party, you'd think the two sides of the family would have banded together. Instead, they competed with each other and it was for personal reasons that Theodore's daughter Alice spent many years viciously attacking Franklin Roosevelt's policies, even though they were essentially the same as those of her father. By the time Alice's opinions were being regularly published, the Oyster Bay Roosevelts and the Hyde Park Roosevelts (Franklin and Eleanor) had become opponents who were more focused upon their own ambition than their shared interests. Sometimes, while reading The Wars of the Roosevelts, I was taken aback by the consistency of political arguments. So much of what politicians disagreed about in the early part of the 20th Century has not changed at all. 100 years later, our politicians are still using the same exact wording to make their points. Theodore's love of the natural world, acquired as a young boy trying to overcome his asthma, was being codified into national policy. Not everyone saw this as a good thing. Progressives, their critics charged, were all about regulation and control. It was overreach, they argued, to deny Americans the right to develop lands for their own individual gain. The book continues to describe the various family members who were involved in politics, how their political ambitions were rewarded or quashed, how alcoholism and illness affected their aspirations, and the effects of relationships with friends, lovers, or political connections on the family. I'm most addicted to anything and everything about Eleanor and Franklin Roosevelt, both of whom I admire, although they certainly made their share of mistakes and had their personal flaws. I knew less about Alice and her brothers and how their political ambitions played out. Nor did I realize that Eleanor was encouraged to run for office in 1940. 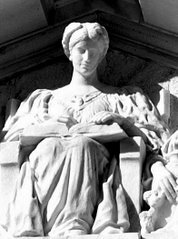 Citing some of the great warrior queens of the past, [The New York Times] demanded of its readers, "What sound reasons can be advanced against a woman for President of the United States?" This country will not be a good place for any of us to live in if it is not a reasonably good place for all of us to live in. Highly recommended - Not including notes, bibliography, and index, The Wars of the Roosevelts is a little over 500 pages long and it's a dense 530 pages, so it took me quite a while to get through the book but it was never an effort. As always with any book about the Roosevelts, I kept my iPad handy and spent a lot of time looking up photos of the various characters and their homes, so that I could picture them when they were described and imagine their interactions. That added to how slowly I plodded through the book but I was always, always absolutely engrossed when I picked the book up to read. 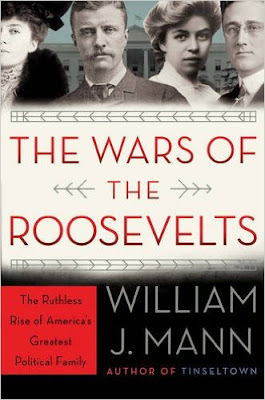 The author doesn't just describe the lives and ambitions of the four characters pictured on the cover, incidentally; the author described the political ambitions of any and all Roosevelts who became politically active, including the women who were unable or unwilling to run for office but whose influence was widely respected, often behind the scenes. The author's attention to detail and heavy use of primary sources is admirable. I appreciated the fact that when quotation marks were used, the reader knew that whatever was quoted was actually said by the various individuals. There was some conjecture (why Alice likely kept the baby who was undoubtedly not her husband's when abortion was illegal but obtainable for women of means, for example) but not a great deal. I'd especially recommend The Wars of the Roosevelts to anyone who has a particular interest in the Roosevelt family or the time periods covered (from Theodore's youth to Eleanor's post-Franklin life, with a jump forward to a modern Roosevelt gathering). Although some of what I've read elsewhere about specific events was glossed over because the focus was on the actors and relationships within this political family, I really enjoyed the additional perspective. Yes, it's true. I have no lovely book stack to share, this week, thanks to a dearth of arrivals and a successful week of not purchasing anything new. And, since I didn't post much but didn't read much, either, this may be the most pitiful Monday Malarkey, ever. Oh, well. Some weeks are like that. Geekerella by Ashley Poston - which I absolutely loved and will gush about, soon. That's it. Since I finished Geekerella, I've been struggling with a single book, all week. Why? Why haven't I just set the book aside? Well, I definitely want to know what's going to happen. In spite of that, It has never fully grabbed me and I actually went to bed without even picking the book up to read a single paragraph twice. If I don't finish it today, I'll probably poke my eyes out with a fork or jump off the roof or something. No, I won't. But, I don't understand why I can't seem to give up, this time. So, yes, that's the book I can't get through. It's a dilemma. The story is actually quite compelling; it's about a young girl who's abandoned by her mother in the early 20th century. She's in China and mixed race, her mother Chinese and her father completely out of the picture. After she's abandoned in the Western Residence of a 3-residence compound, the new owners take her in as a bond servant. 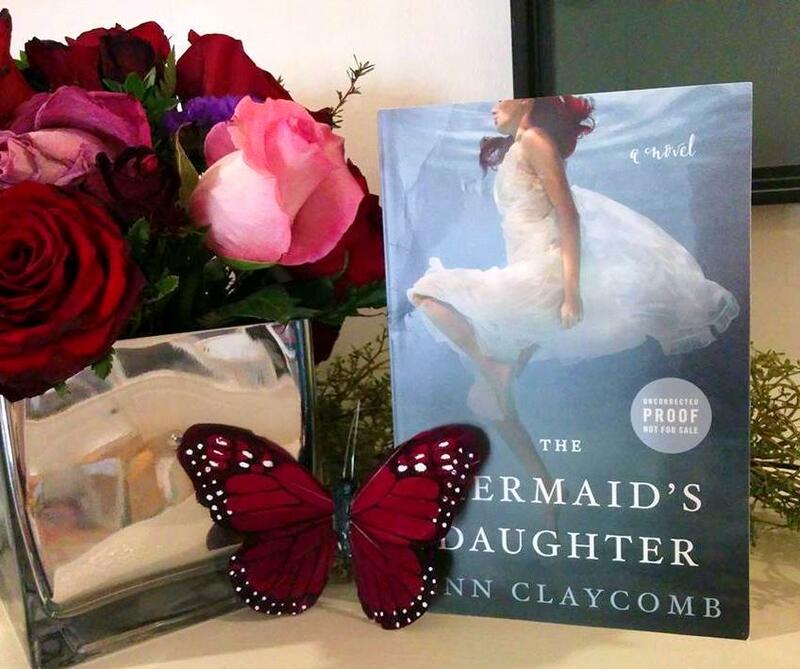 She becomes friends with the daughter of the family but her future is uncertain. What will happen to Jialing? Will she end up begging in the street? Will she be able to keep moving with the Yang family, all her life? I'm a little over halfway through and I still want to know where it's going. But, I'm just not in love with this book and I'm presuming it's a timing issue. So, I really don't know why I haven't set it aside to finish later. Weird. It is also the only book I've even looked at, this week. Double weird. Well . . . one book review is better than none. Seriously, there is not even any other news! So, I'll tell you about a dream I had, last week. I dreamed it was WWII and I was a shop owner in a French village. A few Nazis had arrived and we knew the German army was coming so everyone was packing up to leave. As I was leaving town, I walked through the town square and noticed a toddler girl who didn't seem to be with anyone, running around on her own, so I asked around and nobody claimed her. I took her with me. The refugees of the village were leaving when bombs began raining down around us. I wondered if I should dig a hole. Would that protect us at all, burrowing in? Then, I looked behind an outcropping of rocks and noticed that there was a cave behind them. I climbed up a small hill and went down into the cave, where quite a few other villagers were sheltering, and set the toddler down so she could run around. The cave was safe from the bombs and that's where my dream ended. Everyone I've shared that dream with has said, "It has to do with all the news about the refugee ban." More than likely. I didn't include all of the details but there were some oddities to the dream, like the fact that I packed a deck of cards and that occasionally I was distanced from the characters, briefly, while someone narrated a single line, as if I were watching a movie instead of participating in the evacuation. One of those lines was particularly funny, "As usual, Sonny Bono saved the day." Don't ask me where that came from! 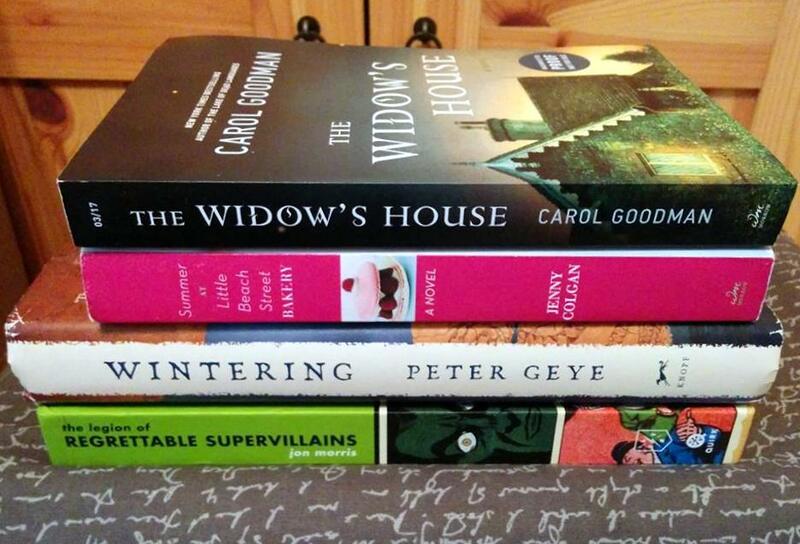 Have you read anything fabulous, lately? Please share, if you have. I spent most of my week buried in my Twitter feed. Bad idea. Cuddle bunnies! 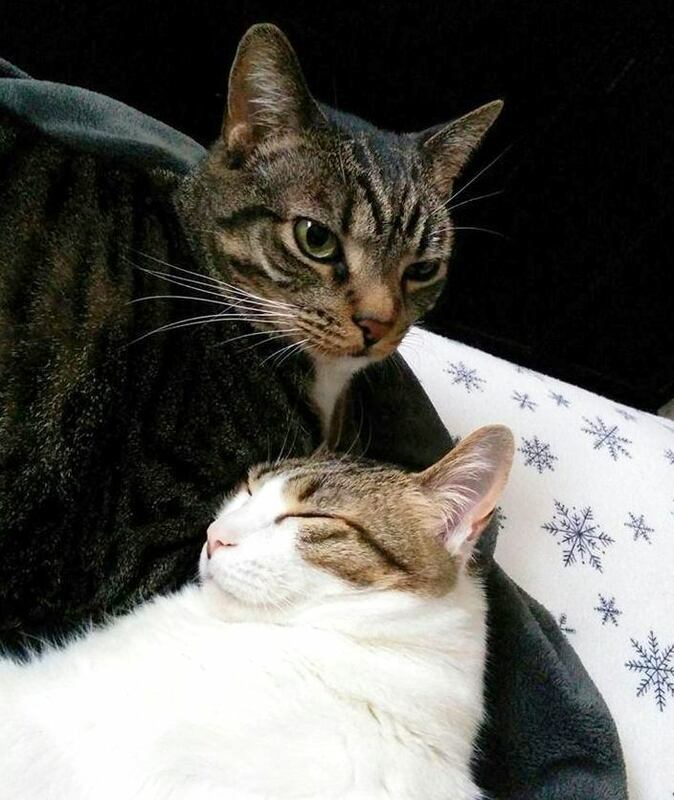 They had their little heads almost touching until I fetched the phone and disturbed Fiona. It's been a few weeks since I read Yesternight, but I still remember it surprisingly well - always a recommendation, in and of itself. Alice Lind is a psychologist who travels around Oregon, testing students to discover any particular difficulties that teachers may need to focus upon. When she travels to Gordon Bay, Oregon, she's asked to pay special attention to 7-year-old Janie O'Daire. Janie is a mathematical genius with an unusual claim: she lived a previous life as a woman named Violet Sunday. Janie claims she lived in Kansas and drowned at 19. Alice knows that she's overstepping her job description as she digs into Janie's life and searches for information on Violet Sunday, but she has her own strange connections to the past and finds the case too fascinating to ignore. Was there really a Violet Sunday? If so, is it possible that Violet was murdered? Is there a connection between Violet and the dreams Alice has had of a place called "Yesternight"? 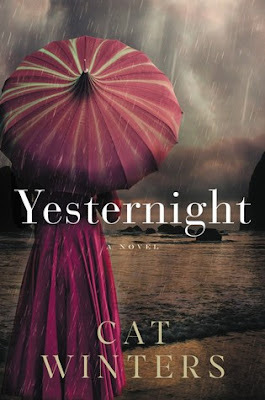 I wrote a spoilery review of Yesternight at Goodreads, immediately after finishing the book, but I don't want to post spoilers, here, so I'll try to keep this as generic as possible. What I particularly loved about Yesternight was the fact that it was intriguing enough to keep the pages flying. I wanted to know the truth about Janie and her past life, whether it was true or not and I liked the fact that the book was so atmospheric. I also thought it was well written and paced. What I disliked was the way modern language occasionally slipped into the book, particularly in the form of swearing. The swearing jumped out at me because I'm old enough to have observed that swear words seem to change rapidly - particularly what's considered publicly acceptable - and the heroine often used words that were considered taboo not that long ago, when I was in junior high or high school. I found it difficult to imagine someone uttering those words in the 1920s. I also found Alice sometimes fell on the "too stupid to live" side. She is described as a woman with little control over her sexual urges. Her sexuality leads to some interesting plot points but I wanted to knock her on the head for being such a moron, a time or two. And, finally, I thought the final (shorter) two sections detracted from the book, as a whole, when Janie's story ends and the book continues with Alice's possible connection to Janie's past life. Recommended - Given the fact that I mentioned more that I disliked than liked about Yesternight, you'd think I wouldn't recommend it, but my complaints were petty by comparison with the overall enjoyment of the book and that's why it's still a recommended read. I liked the way I was pulled into the story and it held on, at least until Janie's story ended. I did have trouble with the final sections and I initially rated the book 3.5/5 because of that. But, then I went back and altered my score to 4/5 because I kept thinking about the story, which is based upon a news report about a little boy who was able to describe his past life in some detail. In other words, I found the book gripping and unique enough that its flaws are worth overlooking. Last week's absence from the blog was completely unexpected so we'll just pretend it didn't happen and move right along. A Constellation of Vital Phenomena by Anthony Marra - Purchased (for $1, so I don't feel too awful about breaking my book-buying ban after a mere 2 weeks, although I also bought a book of Margaret Bourke-White's photographs, so . . . OK, guilty conscience is allowed). Book-buying bans are hard!! I did manage to go to a library sale without buying anything, although there were a few books that interested me, so there's that. But, I couldn't pass up a book that's been on my mental wish list at a mere $1! Even the guy who added up my purchases at Off-Square Books (including one book for Hubby) expressed shock that such a perfect copy of a recent title was marked down to a mere dollar. I was thinking, "Yeah, just hurry up and let me pay you because I feel like I'm practically stealing this book." If you're going to take an unexpected break from your blog, this is the way to do it. Bury yourself in books and don't come up for a week. I would be lying if I said that's what really happened, but you don't want to hear about a car, refrigerator, and dryer all going out in the same week, I promise you. I have not been a happy camper. It feels like almost everything I read the past two weeks was a diversion, the exception being The Wars of the Roosevelts. After focusing on finishing that book, I decided I wanted to read something upbeat and different, even though I had several books going. The Little Book of Hygge fit that nicely. It was fun reading about the way people live in another country and how the Danish deliberately work at inserting gentle gatherings, special lighting, and happiness into their lives. After that, I was having a terrible time sleeping and decided that reading the March graphic novel series might keep me going during a time of low focus. It didn't occur to me, at the time, that we were on the cusp of Black History Month, so that ended up working out nicely. Between the 2nd and 3rd March books, I felt like taking a break from the series because they are, in fact, pretty depressing. So, I read another depressing book: The Handmaid's Tale by Margaret Atwood. Smart. While I haven't officially signed up and I didn't follow the guidelines for reading (because I don't ever deliberately read a book slowly for the sake of discussion), I am planning to join in on discussion about The Handmaid's Tale. 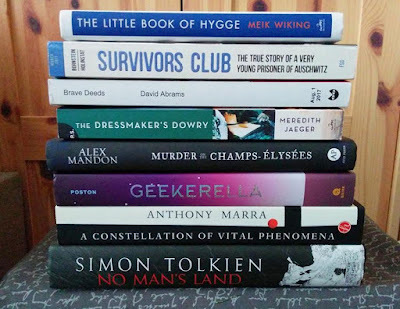 I chose not to write "currently reading" because I'm in a between stage, having stepped away from the books that have bookmarks in them to read 5 that did not. Now, I'm planning to return to my previous reads while adding at least one fiction read, possibly two. The Napoleon of Notting Hill by G. K. Chesterton - I've struggled with this one. It's a tiny book at only about 128 pages and it has its moments, but I tend to dislike satire, in general, as that over-the-top sensation just bugs the hell out of me. It was the second classic I attempted in January and failed to finish. I'll probably DNF it and consider trying another time, but I hate to give up on such a short book, so I'm still waffling about giving up. Metaphors Be With You by Mardy Grothe - A fun book of the author's favorite metaphors, by topic. This should be a fairly quick read, when I return to it. The View from the Cheap Seats by Neil Gaiman - You may recall that I stopped reading this book because I felt like I needed a highlighting pen (which I rushed out to buy). So, I need to backtrack two essays' worth and begin marking those passages I consider the most meaningful. I resisted picking up the book, for the past few weeks, because backtracking is so annoying. But, I need to do that and I will plan to highlight those two particular essays this week so I can move on. Geekerella by Ashley Poston - I just started reading this last night, so I'm not sure if it will stick. I didn't get far before I fell asleep. But, this Cinderella-based story seems like a good choice to give me the much-needed upper break I require after reading about the evils of segregation and all the violence against non-violent protesters, followed by a tremendously realistic and equally disheartening dystopian read. 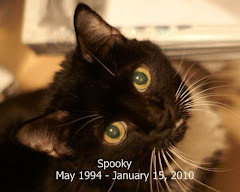 Since then, I've taken very few cat photos. However, I did manage to snap a few pics, week before last, and this one is a stand-out because it's so goofy. That expression on Isabel's face! I got several others of Izzy that were taken at the same time and in the rest she looks relaxed and happy. But this one is the one that catches my attention because it makes me feel a little bubble of laughter, every time. 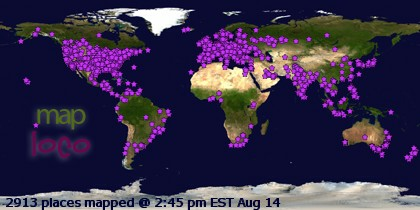 Hopefully, this will be a normal blogging week. I have some serious catch-up to do.